It's another celebrity style battle, and its Stephanie Coker and Chioma Good Hair. Stephanie Coker was in brother orange tone, sweeping her hair in ponytail style. She paired the look with a pair of sunshade and gold heels. 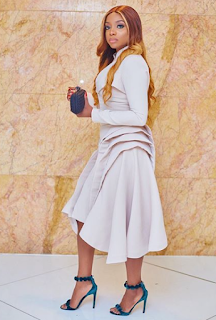 Chioma Good Hair, on the other hand, styled the look with a black pair of Azzedine Alaia shoes and a Bottega Venega purse. Both ladies completely bagged the look, trust me. We just still have to push the question 'who wore it better'. Let your comments roll in, let us know which is ur favourite in the comment box.